They are pretty small plants, perhaps I would call them woody shrubs, with cranberry-like fruits along the branches. Not surprising considering the perfect mix of cool temperatures, precipiation, and elevation, the hillsides of Costa Rica's Central Valley are covered in the crop. In the Valle de Dota region, which produces what many consider the country's best coffee, the "Goldilocks" set of conditions exist - quality coffee is grown at elevations between 1,200 and 1,500 meters, with rainfall averaging 2,500 mm per year, and temperatures between 65F and 80F - essentially juuust right! 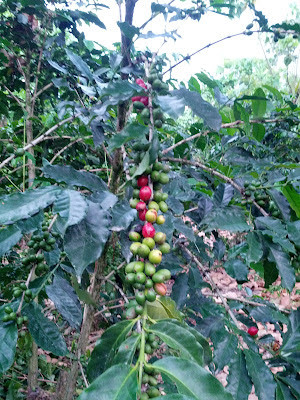 It seems as though your typical coffee farm has a mixture of the coffee plant, a few leguminous (or nitrogen-fixing, e.g. fertilizer) trees, and some banana palms for shade and, well, bananas. First of all, it's important to note, that despite the presence of fertilizer trees, farmers still tend to over-apply nitrogen fertilizer, to the tune of 70% running off the fields! While farmers continue to apply more and more thinking this will increase their yields, there is sadly no correlation with the added nitrogen inputs and yield. Second, and probably more crucial to my own purchasing decisions on coffee, our few days in the Central Valley made me realize the variation inherent in different certifications and designations. I know we have discussed coffee at length on the blog, and shade-grown in particular, but I didn't really comprehend how "shade-grown" can mean so many different things. Often hailed as the gold standard of sustainability in coffee, shade-grown encompasses everything from monocultures of coffee with a couple of species of fertilizer tree and banana palm interspersed, to several varieties of the caffeinated shrub growing in the understory of a forest. And just because it's shade-grown does not necessarily mean it is chemical free. To combat funghal diseases and insects pesticides, fungicides, and herbicides are applied even in these shade systems. Then we have organic, which only amounts to about 1% of Costa Rica's production, and Fair Trade, which has its own discrepancies. So what's a coffee drinker to do, particularly in a country where coffee is so integral to the economy? So let's go back to the Valle de Dota and our little coffee adventure. Most of the farmers in the area are not the big guys, but rather smallscale farmers who have combined forces in cooperatives. In light of July 7th, International Day of Cooperatives, the particular cooperativo that J and I visited in San Marcos - CooperaTarrazu - is of note. With about 2,700 members, CooperaTarrazu provides technical, processing, and marketing assistance. Early on in their 50-year history, the co-op realized the importance of improving both methods for their member farmers and the economic returns, to ensure long-term sustainability. This meant changing variety of coffee grown to a more marketable, high-quality bean; reducing chemical fertilizer and pesticide use and waste from processing; and incorporating shade trees. Fair Trade and Rainforest Alliance certifications, C.A.F.E. standards (pdf), and the Pesticide Action Network's approval in concert not only improve sales and export potential, but also have strong explicit social and environmental criteria to ensure better production and proactive management. With my bag laden down with bags of coffee (and smelling wonderfully, I might add), I have a new appreciation for the whole value chain of a cuppa. I've said it a million times, but now I feel its weight fully, as a consumer you have A LOT of power influencing how your coffee is grown. So embrace it and support cooperatives and organic+shade-grown producers. Plus, it's just really good coffee! *once again, the photo is courtesy of J's phone!